The Law Firm of David Azizi has helped many clients who were injured in golf cart accidents. He has also been there for the families of those killed in such accidents. Whether filing a claim against an insurance company, litigating a golf cart personal injury case in court or filing a wrongful death lawsuit, David helps recover the financial loss associated with the golf cart accident injury or the financial burden due to the wrongful death of a family member. If you or a loved one was involved in a golf cart accident, call David at (800) 991-5292. We are available to take your call 24/7, and we can schedule a free, no-obligation case review. David wins 98 percent of all cases and never charges a fee until your case is won. Over a four-year period, 147,696 injuries due to golf cart accidents occurred, according to the National Electronic Injury Surveillance System* that monitors emergency room visits. The Consumer Product Safety Commission** reported that in one year alone, golf cart accidents injured 17,000 individuals nationwide. Of the 17,000, 40 percent were injured by being ejected from the carts. Of the total number of ejection incidents, 40 percent were children under 16. Seventy percent of all these accidents happened on golf courses with the remainder occurring on roadways. The number of accidents increased annually by a factor of 130 percent. Take pictures: Use your cell phone to take pictures if possible, and capture the position of the golf cart on the course or street. For instance, were you on an incline or decline? Were there exposed tree roots? Did the cart rollover? What was the golf cart’s final position? File an accident report: If the accident happened at a golf course, policy might include filing a report. Ask if it is not offered. If the accident occurred on the street, a police officer might be present, and will file a report. Obtain a copy of either the golf cart incident report or one filled out by a law enforcement officer. Obtain witness information: If there are witnesses, obtain their contact information. If other individuals did not witness the accident but are present to witness your injuries, ask for their name and telephone number too. Ask if other players have witnessed similar accidents in the same spot. Go to your doctor: If you do not need emergency care, see your doctor as quickly as possible. It is important to have a documented medical evaluation of your injuries. Follow your physician’s instructions. Take photos of your injuries: Once you are home, take photos of any abrasions, lacerations or bruises on your body due to the accident. Continue to photograph your injuries the second and third day, as bruising can settle and be more apparent. Start a diary: Keep track of how you feel on a daily basis. This is important because over time you might forget. Don't Delay Get Legal Advice Right Away! We know you have questions, call or live chat 24 hours a day. The entity/person had a duty of care toward the injured party to provide a well-maintained, safe vehicle, give adequate warnings and operating instructions and provide a safe environment for its use. The duty of care must have been broken or breached. The action that breached the duty of care, or lack of action, must have caused the plaintiff’s injuries, something that was reasonably foreseeable. The injuries had financial damages associated with them. Premises liability at the golf course: This involves maintenance of the course in such a way as to keep it safe for users. Tree stumps, exposed tree roots or sharp breaks in the terrain can cause a golf cart to flip over. If the problem cannot be removed, warning signs should be placed to keep players from driving through the area. Proper instructions on how to operate a golf cart: This means that the operator of a rented golf cart should be given adequate operating instructions before taking the cart onto the golf course. When a golf course owner/employee fails to do that and an accident happens, the owner or his or her employee/representative can be considered to be negligent. In addition, manufacturers are required to provide proper instructions to the purchaser of a golf cart. Failure to warn of golf cart rollover danger: Golf carts have a propensity to rollover, and it is necessary that operators are warned about this possibility as well as the reasons, such as speed or sharp turns that can initiate a rollover. The golf cart is fitted with a hip/hand-held restraint only, lacking seat belts. The current laterally placed hip restraint is too short and too low to provide the needed support to avoid an ejection. Some experts recommend that not only should the hip restraint be redesigned, making it taller and longer but that it should be moved forward too. The lateral acceleration of the cart increases dramatically during a turn, particularly with increased speed, placing the occupant in danger of ejection. If the individual is holding onto the current hip restraint, there is an increased risk the person could fall from the cart due to the restraint’s inefficient height and length, striking their head on the ground due to a tripping mechanism. The person is of insufficient height and weight with an inadequate grip strength to hold onto the hip restraint bar, keeping them from being ejected. This happens most often with young children. In order to use the hip restraint properly, the person must be able to respond quickly to impending rollover. It is best to keep a tight grip on the hip restraint at all times. However, many times this does not happen, so the person’s reaction time to grab the bar must be short. Children under a certain age*** do not always react quickly enough, causing them to be unable to grab the bar in time. In addition, the person must use their feet to provide additional support to stay in the cart. In most cases, a child is too short to do this. 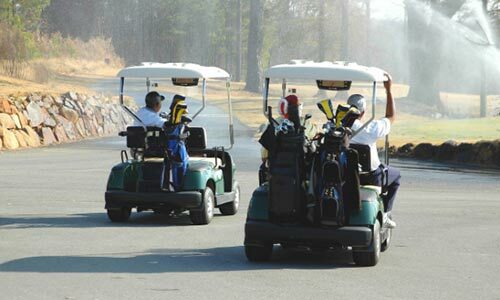 Maintenance of golf carts: The golf course must maintain rented golf carts. If maintenance is compromised, the owner could be held responsible if an accident occurs. Further, if a third party who is not qualified to supply golf cart maintenance is hired, the owner can be held liable if an accident happens due to the person’s incompetence. If you are injured in another person’s privately owned golf cart, the owner is responsible for its upkeep. Design: The design of the product is in itself defective and capable of causing harm such as the lack of adequate golf cart restraints. Manufacturing: In this case, the defect is caused during the manufacturing or assembly process. Marketing: This is a problem with the way the product is marketed to the consumer, including incomplete or absent warnings about possible dangers or inadequate instructions on how to use the product. Taller and longer hip restraints or central ones could provide greater protection for occupants. The use of seat belts has been advocated by many safety experts, particularly for faster LSVs. Golf cart manufacturers have said that seat belts would make it less likely an occupant could jump from the vehicle in the case of an impending rollover. The argument that a child or someone who is older could jump from the golf cart as it is about to roll over has been challenged. Hip restraints (visualized in the photo above) have a low height and short length. This may be something golfers appreciate since getting in and out of the cart happens many times when playing. In lieu of seat belts, a hip restraint is usually located at the outer part of the seat. Unfortunately, with increased lateral speed when making a left turn, the restraint located on the outside portion of the seat acts like a pivot point when the lateral acceleration changes. The driver who leans inward on the bench seat is usually not ejected. The passenger instead leans toward the outside of the cart. The tripping mechanism that throws occupants to the ground, usually head first, could be eliminated if a centrally-located restraint is used or the height and length of the lateral restraint is increased, according to Technology Associates****. This would still allow occupants to jump out of the cart if rollover was imminent and make for easy entrance and exit from the cart. Since manufacturers are expected to put safety as a primary concern when it comes to their products, continuing to use hip restraints of this type may be seen as breaking their obligation of safety to consumers. If someone is hurt due to this breach, and the injury is directly related to the lack of proper restraints, the injured party can ask for compensation of financial loss due to the accident. Because of their size and lack of grip strength, children should always use seat belts at any speed. Holding onto a hip restraint, especially when the cart is moving into a left turn, would be hard for a child. In addition, if the child is not already holding onto the bar, their reaction time may not be quick enough for them to grab onto it. Modifying golf carts that are meant to operate at a maximum speed of 15 m.p.h. so the vehicle can reach a higher speed without introducing additional safety measures is another breach of responsibility, usually at the manufacturer and dealership level. Modified golf carts are often able to exceed the speed of the original vehicle configuration to a speed just under the FMVSS 20 m.p.h. limit such as 19.5 m.p.h. This change can make use of the cart more dangerous since it exceeds the manufacturer’s performance capability yet not require that necessary safety features are added. Aftermarket modification is common. Other modifications such as bigger wheels and seat cushions can change the dynamics of the cart, affecting safety. When changes are made, it is necessary to make sure the safety of the golf cart is not compromised. Medical Expenses: This includes emergency transport vehicle costs, hospital and doctor bills, medication, medical tests, rehabilitation therapy or nursing services at home. Lost Wages: If the accident prevents you from working, you can recover the wages you lost. In the event you cannot return to your job, you may be able to recover future lost wages as well. Ancillary Expenses: This includes the cost of traveling to your doctor’s office such as gas or taxi fare. Pain and Suffering: This includes emotional and psychological issues as well as chronic pain associated with your accident. To get an idea of what your case is worth, visit our golf cart settlement calculator. Fill in the information and submit it. David will review it with you during your scheduled, free case evaluation. Fractures Second most common injury; upper extremity fracture is the most common. Hospitalization usually required. Head and Neck Injury Includes cervical strains, vertebral herniation, ligament and tendon injury, concussion; most common injury in children; usually related to falling from a golf cart. Intracranial Hemorrhage (bleeding in the brain) This includes bleeding in the brain or the skull (subdural hematoma). Soft Tissue Injury Most common golf cart accident injury, particularly to those hit by golf cart. This usually occurs to the lower extremity. 97% are treated and released. Laceration This occurs approximately 15% of the time, usually to the head and neck. Lower Extremity Injury Lower extremity injury is common in adults. Spinal Injuries Spinal injuries in the cervical, thoracic and lumbar areas can require surgery. Thoracic/mid-back and lumbar/low back are not as common as cervical or neck injuries (see above). Falling from a golf cart is common for both children and adults, however, the frequency is higher with children. Concussion is often a result of falling. Adults are often injured when entering or leaving the golf cart. Signage allowing golf carts is a necessary element. California is home to 1,155 golf courses. The County of Los Angeles operates 19 public golf courses in addition to private golf clubs such as Brentwood, Armand Hammer and the Los Angeles and Wilshire Country Clubs. With so many courses and neighborhoods built around many of them, the State of California DMV† has rules and regulations for golf carts and LSVs. In one Southern California city, of 18,000 residents, 2,000 use golf carts to get around. According the the American National Standards Institute‡, the most important difference is speed. Golf carts are limited to going over 15 m.p.h., while LSVs have a top speed of 25 m.p.h. The LSV must be able to attain a speed of greater than 20 mph in a distance of one mile. See below to find regulations in California for each. Reach a max speed of 15 m.p.h. Roadway use: Some vehicles are operable on some streets, except for state highways, that are within one mile of a golf course and designated for that purpose with appropriate signage, lighting or markers. Such use does not require registration. 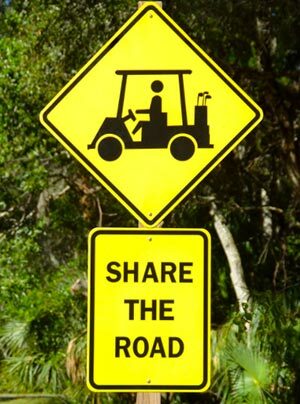 Other than this, the golf cart cannot be used on roads with a speed limit above 25 m.p.h. except to cross a roadway with a speed limit of 25 m.p.h. Required to have one headlamp, taillamp and stop lamp, and rear, front and side reflectors. 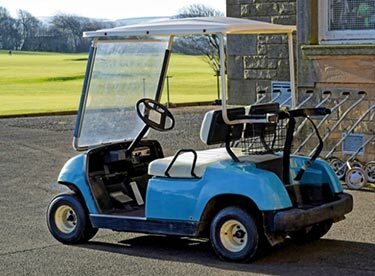 Commonly, golf carts, including golf carts rented to the public at golf courses, are returned to the manufacturer. Some are sold to private individuals, airports and the wider aftermarket for golf carts. In some instances, the carts are modified as to speed. If the carts exceed 25 m.p.h., they must comply with FMVSS standards. Also, accidents on asphalt may have a different cause such as ruts in the street or potholes. If you’ve been in a golf cart accident, you may be aware of the safety issues involved. 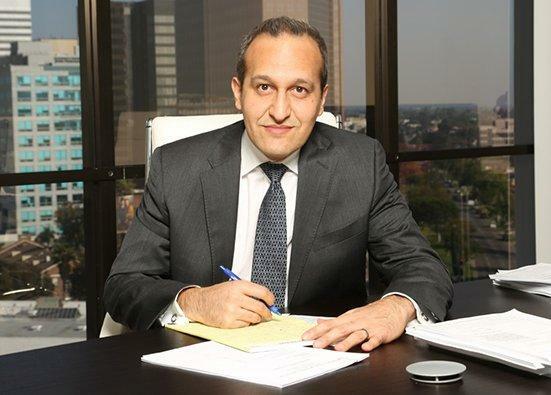 David Azizi is and he wants to help you recover the damages you suffered. Take a moment and give his office a call. We are here 24/7 to set up a free, no-obligation case review. David can answer your questions and let you know your options. David has been an attorney in the Los Angeles area for 21 years, practicing only personal injury law. He has been honored by Super Lawyers as the top-rated personal injury lawyer in Beverly Hills and by Expertise.com as one of the top personal injury lawyers in Los Angeles. These accolades are reflective of David’s standing in a community that knows he is always there for them. This combination of diligence, experience and tenacity is what allows David to win 98 percent of his cases. Call (800) 991-5292 today.